Description: This system will work with .223/5.56 x 45 mm NATO. 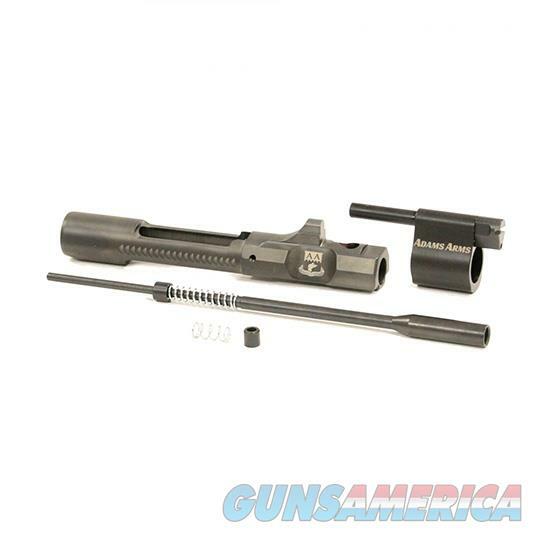 - Kit includes: - Patented One-Piece Bolt Carrier - P Series Micro Block - Adjustable (5 Settings - 100%/74%/53%/32%/11%) - Upper Receiver Bushing - Bushing Installation Rod - Bolt Spring - Drive Rod with Bushing and Spring - Installation Instruction Card - The Adams Arms Piston System: - A short stroke free floating piston system. - Is Self-Cleaning. - Carbon and gases are expelled forward away from operator. - Corrosive resistant coating processes. - Harmonics are not transferred into the barrel. - Doesn't vent directly to atmospheric pressure; this eliminates flash signature and super sonic crack which is optimal for night vision and suppresses fire. - Has a Lifetime Warranty.